The First Marine Air Wing ordered night armed reconnaissance flights into A Shau Valley in May 1967. I was assigned the first Death Angel reccie on May 7 and chose George Cummings for my wingman. George was a fearless tiger! I wanted a bold wingman for a hairy night frag with bad weather. George had been in A Shau on a day mission during April with Rocky Plant. A Shau was always hot and George took a huge hole in the right center wing panel. George made it safely back to Da Nang where Juan Lara and Jon Kirkwood, outstanding metalsmiths, patched the 18 inch hole sufficiently for me to fly the damaged crusader on April 12, 1967 to Cubi Point for major repair. I owed George big time for the three days of San Miguel Beer and flush toilets. It was 11 PM when we passed the Club on our way to the Intelligence briefing. The pilots could be heard singing and laughing. "What's the boiling point of piss?" someone shouted. A chorus of yells responded, "Two Thirty-two!" The Red Devils were our sister Crusader squadron at Da Nang. Three pilots could be seen hanging by their heels from the rafters. The stunt was a favorite. Group CO Art Schmaegle had tried without success to curtail such activity. We manned our aircraft after midnight. Caulkins, Harris, Hinton, and Thompson had the planes ready and expertly sent us out. We were proud of our maintenance crews. Cape and Rabon armed the guns as we held short of Runway 17 Right. I keyed the mike, "Da Nang tower, Wagecut three zero, two F-8s for takeoff." Da Nang tower responded, "Wagecut three zero turn right within two miles. Live artillery fire between 130 degrees and 240 degrees for 13 miles. You are cleared for takeoff 17 right. Contact Joyride when clear of the traffic pattern." The afterburner gave a hard jolt with eight 500 pounders hanging on the MBRs. In my right mirror, I saw George light his burner within four seconds. He seemed to want a rapid join-up. I sucked the gear up quickly and lowered and locked the wing before the field boundary. At 270 knots I came out of burner and started a right turn to the north. Even with my thirty degree bank, George was inside and closing into cruise formation. He was flying superbly on a black night! I dimmed my navigation lights. "Mofak, go Joyride." I said. "Dash two." George answered. "Dash Two." George was up. I keyed my mike, "Joyride, Wagecut Mission 30, airborne Da Nang five two with 16 Delta 2's and 800 Delta 20's for armed reccie with Ancestor. One plus 30 in route and two plus 00 fuel." Joyride came back with, "Contact Landshark Charlie on green." Five minutes later, we made contact with Landshark and passed on the required information. "Roger, Wagecut. Contact Ancestor 895 on purple 20 miles west of Phu Bai." Landshark replied. We headed for the north end of A Shau. We had planned the first run from north to south to approach Charlie from his six. Always think like a fighter pilot! I contacted Ancestor, the Marine KC-130 assigned for flare drops. Ancestor responded, "We are orbiting at the south end of the valley at angels 15. We have a line of thunderstorms west side of A Shau along the Laos border. Could you make the first run from south to the north?" I recognized his voice as an old friend, Bob Short. There went our plans! "Affirmative, 895. Make a pass up the valley and kick out a string of flares. Then we'll reccie the road for trucks." Bob flew the KC-130 up A Shau at 10,000 feet and kicked out about 8 flares. When the flares lit up the valley floor, we dove down to 500 feet above ground in trail formation at 500 knots. We checked 20 miles of route 548 between A Shau and A Loui airstrips. Charlie must have pulled off the road under jungle canopy or into bushes when the KC-130 flew up the valley. "No joy!" I reported. The flares cast weird shadows on the ridges and valleys. Each flare looked like a large brilliant, sparkling white star which was slowly falling while spewing white foam that hung in the sky hours after the hot flare was gone. 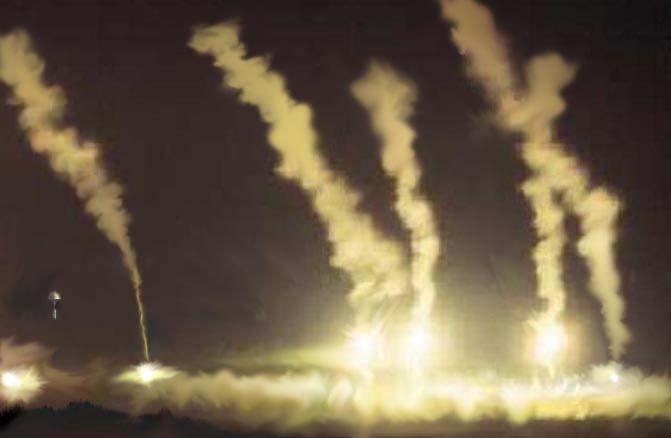 Some flares ignited the small parachute and then trailed a bright smoking stream of White Phosphorus while plummeting to the ground. After impact, they continued to flicker and burn, eerily distorting the landscape. "Ancestor, make flare runs up and down the valley. We'll go for road cuts and hope for some secondaries. Our runs will be from south to north with a right hand pattern. Stay above ten thousand. We'll roll in at nine." We were disappointed at having to resort to road interdiction which was a daytime job. Charlie outsmarted us again. Dodging ghosts (a parachute with dud flare canister), George and I made repeated runs on the winding road down the center of A Shau. We used forty-five degree dives and were out by 2000 feet--safe from small arms fire. Radio calls were made at roll in, off, and bomb hits. The bombs appeared to impact on or near the road. After four runs of dropping pairs, I called, "One off, final run." Right after my transmission, I saw a cluster of rapid fire muzzle flashes from 11 o'clock on my pull out. Red tracers floated up in front of my Crusader. The tracers bent and rapidly accelerated by me passing above and to the left in bright red streaks. The visible AAA always caused us anxiety because we figured eighty percent of the rounds being fired were invisible. I called out, "We're taking fire! Left side of the road! Eleven O'clock from my last drop!" While jinking right, I lost sight of the AAA fire. George called, "Dash two in hot on final run." I was abeam as he made his pass. Flashes were visible beyond and left of his aiming point. Tracers passed over his plane in a steady stream of red streaks. Ancestor transmitted, "I'll use my glasses to pinpoint the source of the fire." George spoke. "Dash two is off on final bomb run." His bombs detonated on the road about 400 meters south of the gun position. I called, "One is in hot with 20 mike mike on Charlie's guns." I aimed in the area of the last flashes. The flares were dying rapidly with one flickering on the ground and another winking out below 1000 feet. I strafed down to 2000 feet and pulled away left. The flares expired. The valley went from day to dark night. "Ancestor, we need some light!" I called. Bob said, "Ancestor starting another flare run." Bob dropped four flares. George and I shifted our runs from the north and strafed along the west side of the road. Without the enemy guns firing we could only guess where the AAA site was. No more flashes or tracers were observed. Maybe Charlie assumed we were gun-less when he opened up on our final run. When the 20 mike mike began exploding like grenades all around, Charlie must have sought cover. After probing for about five minutes, I spoke, "Skip it! Vector home plate!" "Thanks for the fine flare work, Ancestor 895." I transmitted. "We're bingo for Da Nang." Bob was already guiding the KC-130 for home plate. George slipped aboard. We Vmaxed the 55 miles back to base. Feeling short-changed on excitement in A Shau, I called for break three miles north descending to 500 feet at 600 knots. All hands within ten miles of Da Nang would know the Death Angels were overhead. 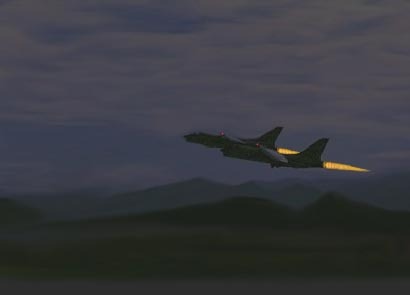 Our trick was not very smart considering the small arms fire we sometimes received at night on final approach. Adding to the screaming multiple bomb racks, we hit the afterburners as we broke. After landing on 17L, the gun crew disarmed us and we taxied the long way around to our revetments at the northwest end of the base. Caulkins and Thompson parked us in the fuel pits. After shut down, we used our flashlights to check the planes for holes and leaks. Both planes required only fuel and ordnance. At the line shack we completed the yellow sheets. The Jeep driver drove us to Group Intelligence for debriefing. It was nearly 4 AM before we fell into our racks. George and I had no trouble making zees that night. Back to Back, We Face the Past.